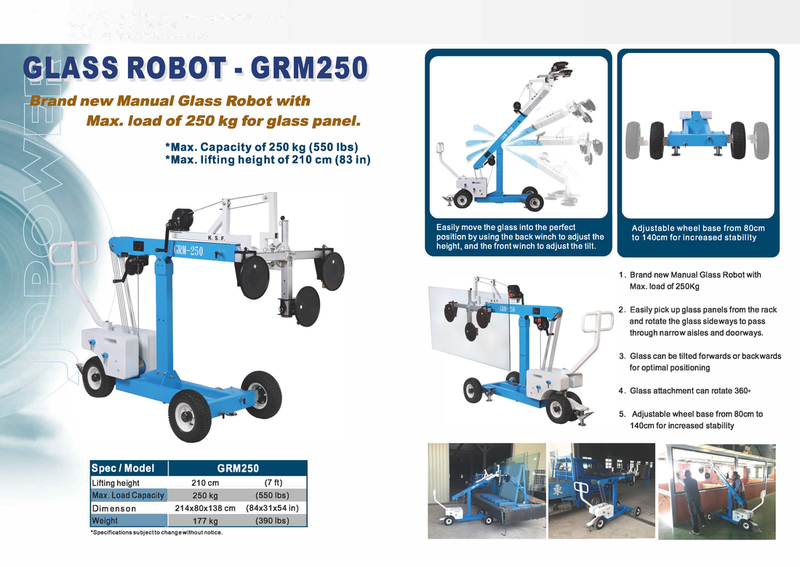 Glass Robot GRM-250: Work smarter, not harder. The Glass Robot GRM250 is an amazing piece of equipment. Three large suction cups can pick up a maximum capacity of 550 lbs and it has a max lifting height of 83 in. Easily pick up glass panels from the rack and rotate the glass sideways to pass through narrow aisles and doorways. Glass can be tilted forwards or backwards for optimal positioning, and the glass attachment can rotate 360 degrees and the wheel base can adjust for increased stability. Also works on tile and countertops!